There are challenges in measuring remarketing impact, and this is a good thing. It means less competition. Compared to most forms of paid for clicks, remarketing costs very little, and yet, the audience for the ads is the warmest possible, including customers, current prospects and historical visitors to the website. There is a ‘golden rule’ .. If your website is working already, then remarketing will amplify it. Lead generating websites will often support successful remarketing campaigns. But if you are concerned, it probably pays to realise that you might not be seeing the full results, because they are hard to measure. A marketing service that understates its success, who’d have thought! We all instinctively know that brand awareness works. The only issue in the past was, only the big companies could afford tv and national press marketing. Remarketing means that your brand is shown so many times, and generally costs so little, that even a small success will make this worth doing. Your remarketing audience is already aware that you exist, you are reminding them, often, of the original intention they might have had when visiting your website. Ironically, One of the reasons it costs so little is that it is hard to measure. The true effects are not felt immediately, it may take months before the impact is felt. And because Digital Marketers are used to ‘click certainty’, those who can’t ‘see the value’ in the short term will often give up. Less competition in an auction means lower prices generally. Remarketing Ads run on the websites of ‘publishers, from the Daily Mail to the smallest of blogs. The click costs don’t look high, on average, but averages hide vast swings in costs. By excluding the higher cost ‘site placement’s of the ads, then the click price can also be brought down. This is one place where higher prices often do not correlate with better performance. We are interested in the user, not the publisher site they happen to be on, especially if it has nothing to do with the original subject – which is more often true, than not. Being conscious of this helps make decisions. Lots of people are served remarketing ads, lots of times, but not many of them click, they’re doing something else at the time. The idea of remarketing is to ‘remind’ people of their initial site visit. The most impactful imagery will be that of the page they landed on, the highest signal of original intent for coming to the website in the first place. It doesn’t have to be a big design exercise. But, thought should go into the customer experience, and what you say. Campaign clicks are measured with goals, conversions and revenue measured in the same way as other paid click campaigns. Due to the short buying cycles involved, the simpler products are easier to measure, as ever. Don’t forget though, that the audience has already been to the website, and potentially, those clicks have been paid for twice. Would those visitors have come back and placed orders anyway. Counter that thought with the long-term benefit that ‘brand reminders’ might bring more repeat business. Measuring remarketing is not as straightforward, but thats a good thing. Our most valuable visitors take a long time to make a decision. It makes sense that the higher the value of the product or service, the longer the buying cycle. For very high-value purchases, the remarketing facility could be paid for by one influenced customer. How do you measure something that people don’t click? As well as the cost per lead for remarketing conversions…. Keep a track of direct visits, these should increase over time. Branding works to remind people that they were interested in a subject. When they are busy doing something else, they will often come back to it later. 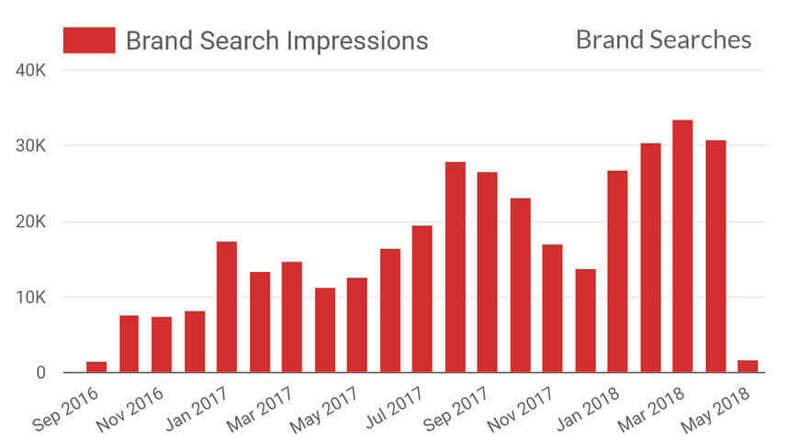 Running Paid Ads for your Brand Name, the number of people searching for your brand should increase over time, increased brand impressions is a signal that ‘marketing’ is working. But we like it that way, it means less competition for something that is instinctively valuable in extending the value of the click.